If you are in Bangkok, The City of Angels, on business or for leisure, and want a little beach time to escape from the bustle of the city, you have a few choices: The closest beach destination and most popular one is Pattaya, just 2-3 hours South of the capital. Read on to find out how to make the most out of a trip to Pattaya! I love Bangkok – it’s one of the most fun cities in Asia to me, offering great food and shopping, lots to see and do and a great infrastructure as a base to explore South East Asia. It’s also a very busy city and even if you love it, you probably want to get away at some point and relax on a beach, without having to get on a plane! Pattaya is the closest and easiest to get to, if you don’t have a lot of time! It got its start during the Vietnam War era as a destination for soldiers to rest and relax and has retained a somewhat raunchy reputation ever since. Over the last few years, Pattaya has made an effort to improve its image and become more of a family destination, with some success. Today, you can go to drink and party or to relax with family, and probably never notice the “other side” of Pattaya. You want to pick your hotel and beach carefully to find the experience you are looking for and avoid unpleasant surprises. South & Central Pattaya are the “entertainment” center of Pattaya, with all the drinking, dancing and naughty nightlife. If you want to get a break from the big city, this is not where you want to be and I’d avoid it! North Pattaya has some of the nicer resorts and also a quieter beach. Unfortunately, the long stretch of sand is crowded with beach chairs, offered by pushy vendors that have resulted in some unpleasant scenes with tourists who just wanted to stick their toes in the sand! The city is trying to recover some of the beach and I’m rooting for them! 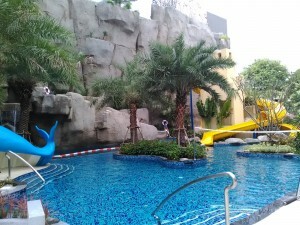 I’ve stayed at the Mercure Ocean Resort Pattaya (recommended!) and the ibis Pattaya next door. Because the beach is not that nice, I’d recommend to book the nicest hotel in your budget to make the most of your getaway! Jomtien Beach to the South is my personal favorite for a quick trip. It’s more peaceful than Pattaya Beach and you can choose from beach chairs or open stretches of sand to lay out. You can go for a stroll along the promenade or the beach, rent beach chairs and get drinks or a massage right on the beach. While it’s no Robinson Crusoe experience, it’s a nicer beach than Pattaya itself. You’ll find some upscale resorts right on the beach, like the Rabbit Resort or the Avalon Beach Resort. I have stayed at both of them and enjoyed them. There are also a lot of small, independent hotels on the little alleys leading away from the beach, making for a bargain stay in exchange for a short walk! I stayed at the bbhouse right on Dongtan beach, a great budget alternative (review coming soon!). Pattaya is the easiest and most convenient beach to get to from Bangkok. It’s also very, very cheap, making it a great budget destination. It also offers nightlife for any taste – no really, ANY taste! But a tropical island paradise it is not. So, if you are looking for that, Thailand offers many much nicer beach destinations, like Phuket, Ko Samui, Krabi or any number of islands just a short flight away. 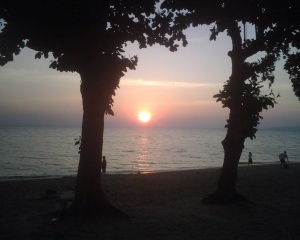 If you want more peace & quiet, check out my posts Escape from Bangkok: Ko Samet and Escape from Bangkok: Hua Hin! How to get there and around: What makes Pattaya so convenient is the number of inexpensive options to get there! There are public buses from/to the city and the airport, so you can add it to the beginning or end of your visit to Bangkok, without a lot of extra travel time. There are buses leaving every 30 minutes from the Eastern Bus Station (next to Ekkamai BTS Station) and from the Northern Bus Station (near Mo Chit BTS Station), making it easy to get there from anywhere in Bangkok. Tickets are under $4 one-way and the trip takes about 2-3 hours. They will go to the Pattaya Northern Bus Station, from where you’ll need a shared taxi or individual taxi to your hotel. There are also buses from/to the Suvarnabhumi Airport (BKK) that take about 1h30min – 2h and are also less than $4. They leave every hour, on the hour, from level 1 (one level up from airport train) at station 8 (exit terminal and go all the way to the left). They stop a few times in Pattaya (at the main road) and end in Jomtien, perfect for a stay there and with easy access to the Bath Bus (see below)! By taking the Airport Rail Link to the airport (and avoiding city traffic) and getting on the bus, you’ll get there quickly and easily – my new favorite ride! You can find more information here! A popular alternative is to take a minivan. They used to leave from Victory Monument (BTS Station), but now leave from the Ekkamai Bus Station, same as the big buses. They are about the same price and are a little faster. I’d only recommend them, if you don’t have luggage. Space is limited and you might have your bag in your lap or at your feet! They tend to drop off near beach road, so you can connect to the “Baht Bus” described below. You can also take a taxi to take you door-to-door – the official fare from the airport is THB1,050 plus THB60 for tolls, or you can negotiate Pattaya-Bangkok between THB1,100 – THB1,500 ($30-45). 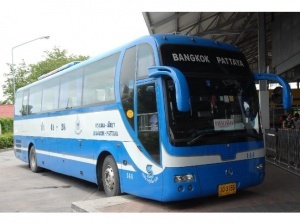 If you take the bus or van or want to get around Pattaya, you can use the “Baht Bus” in Pattaya. 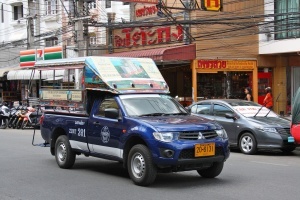 The “Baht Bus” are open, blue pick-up trucks with two benches facing each other in the back and a roof. They drive along the beach roads in Pattaya and one also goes to Jomtien. It’s a shared ride and the fare is a flat THB10 (or THB20 from the bus station to the beach). Don’t get into an empty truck or ask “how much?” – the driver might assume that you are “chartering” the ride and will charge many times the fare! Just ring the bell button in the back to get off and give the fare in correct change to the driver through the window! You can find the routes here! This now works exceptionally well, with drivers accepting the THB10 fare without issues, even giving change without haggling. They are very popular and run frequently.